What if an important file is deleted from removable disk? Or you press the delete key when you are browsing photos. File loss from removable disk may happen to everyone including me. So this is why all of us should be aware of removable disk recovery and protect data from accidental loss. It is heart-struck to lose important files from removable disk when we didn’t have time to make a backup. Lost files can be photos that we can capture past moments, or documents that we spend days to work on. What’s worse, lost files are important working materials and reports. Such issue brings great loss either mentally or financially. If you ask whether there is quick method to do removable disk recovery, you’ll get an exciting answer. You can easily recover deleted or erased data from hard disk, USB drive, removable drive, virtual disk, server, etc. with the aid of hard disk recovery software. Removable disk works on the same principle as hard drive in computer. Sector is the smallest data storage unit. Partition on removable manages files using file system such as NTFS, FAT32. When a file is deleted, its info will be erased by file system, and data itself turns invisible to system. So as long as sectors taken by the deleted file are not replaced by other files, the deleted file is still recoverable. Removable disk recovery software is able to find it and make it come into view. What is removable disk recovery software? 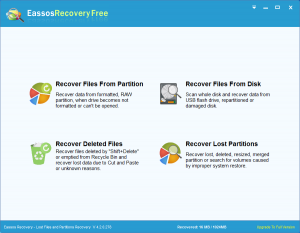 Removable recovery software such as Eassos Recovery is a specially designed software to retrieve lost or corrupted files from removable drives. The file rescue program can work on any computer that runs Microsoft Windows. This recovery software supports various brands of disk for example, Sony, Seagate, Kingston, Nikon, Transcend, etc. USB 2.0, 3.0 and 3.1. 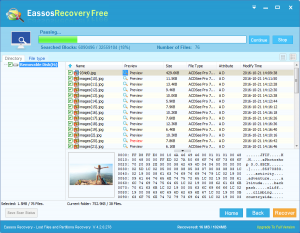 Eassos Recovery provides recovery of images, pictures, documents, compressed files, apps, multimedia files, etc. 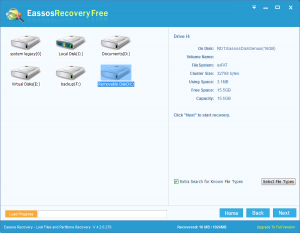 Step 1: Install Eassos Recovery to your computer not the removable disk. Step 2: Launch this recovery software and select recovery mode. Step 3: Select the removable disk and click “Next” to scan it. It’s quite easy to choose the target disk, for this interface is identical to the way My Computer display drives and partitions. Step 4: Select and save wanted files. Finish these steps, and you can access lost files again. So the whole recovery process is a no-brainer. This entry was posted in Data Recovery and tagged hard disk recovery, hard disk recovery software, removable disk recovery by EASSOS. Bookmark the permalink.